Sigh. Sometimes I come across a vacation photo from some far away land that I've never been to and wonder what it must be like. I've been to Mexico, I've been to the UK, but I've never been to Paris. I've always been curious. What's it like? What are the people like? Who will I meet? What will I see? 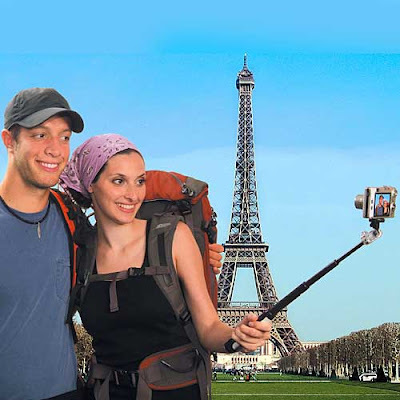 Apparently Paris is overrun by badly dressed college kids (or contenders for The Amazing Race). They can not afford hotel rooms so they simply wander the streets like gypsies, mattress-sized backpacks in tow. They are too "independent" to ask a complete stranger to take their picture, yet they'll gladly hold their expensive digital cameras at the end of a stick for plucking by thieves on motor scooters. It's only a matter of time before these dolts find their way to New York City, where, in addition to having their wallets stolen, they'll be beaten to death with their stupid camera tripod by some burned out, needs-a-tropical-vacation-thousands-of-miles-away-from-everything blogger. I'm boycotting your comments until u go back to the old format! Viva la revolution!!!!!!! Yes, boycotting my comments by leaving a comment.